Nearly a year ago I in a response to Fed Chair Janet Yellen’s apparent concerns over the valuation of the US stock market argued – echoing Irving Fisher’s ill-fated views from 1929 – that the US stock market had reached a “permanently high plateau”. Over the last year US stock prices have continued to inch up (Wilshire 5000 is up around 7% since I wrote the post last year), but recently we have seen a bit of market volatility. So I thought it could be interesting to re-visit the arguments I made a year ago and see whether we still can argue that stocks are on a permanently high plateau. But let me first repeat the disclaimer from last year – this is not investment advice, but rather a quasi-academic exercise. In fact I have no illusions that I am able to beat the market. This is rather about illustrating whether or not one can argue that there is a bubble in the US stock market as some commentators have argued. In my post last year I used a variation of a valuation “model”, which is popular with equity strategists – the so-called Fed model. Essentially the Fed model says that stock prices are determined by the so-called earnings yields, which is the ratio between earnings and bond yields. In my version of the Fed model I do not use earnings, but rather Private Consumption Expenditure (as an monthly approximation for nominal GDP – which over time should move hand in hand with earnings) and a corporate bond yield (Moody’s Aaa rated bonds). We can call the ratio between PCE and the corporate bond yield “fundamentals”. 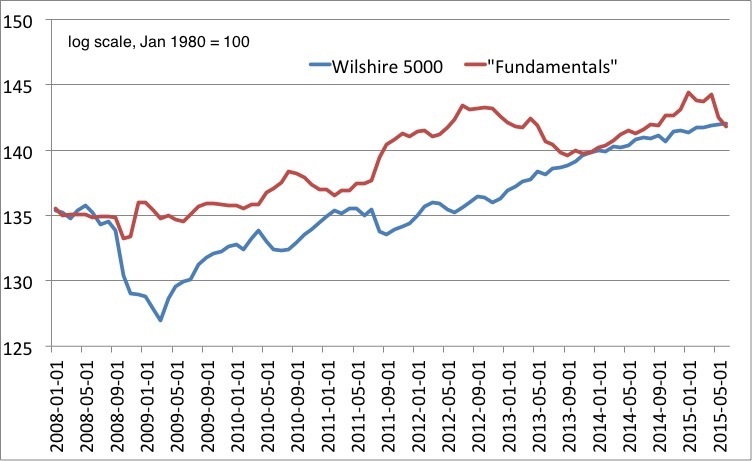 The graph below shows the development in the Wilshire 5000 stock market index compared to “fundamentals”. I have – like a year ago – used January 1980 as the “starting point”. This is partly arbitrary, but also ensures that the two variables over the entire period more or less have the same average. 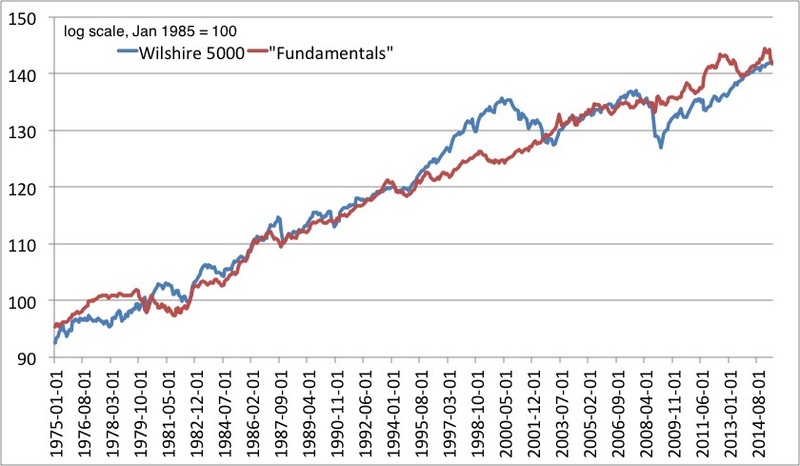 The picture is pretty clear – over the past 40 years stock prices over the medium term have tended to track “fundamentals” (measured in our rudimentary way) pretty closely. There are only two periods where the actual stock market performance has diverged from “fundamentals” and that is during the “tech bubble” in second half the 1990s (where the stock market overshot “fundamentals”) and during the past seven years (where the stock market undershot “fundamentals). This by the way also illustrates that the part of rise in US stock prices since 2009, which can not be explained by higher nominal spending (nominal earnings) or lower bond yields can be explained by a “normalization” of the risk premium on stocks, which spiked on the back of the financial and monetary shock in 2008. In the graph below we zoom in on the Great Recession period. The graph is pretty clear – the recent increase in bond yields (we are up around 75bp since the beginning of the year) has caused “fundamentals” drop, but that drop just brings actual stock prices and “fundamentals” in line with each other so the actual level for the Wilshire 5000 now is nearly perfectly aligned with “fundamentals” (there is less than a quarter of a percentage difference between the two). I do of course not argue that this is the entire story about the stock market valuation and one can certainly question the Fed model (and my variation of it) on theoretical grounds, but I on the other hand find it very hard based on a empirical relationship that have held up quite well for at least 40 years to argue that there is a bubble in the US stock market. What would make the stock market crash? What I argue above is that it is hard to argue that the US stock market is overvalued. However, that does certainly not mean that stock prices can not plumment. In fact when the US stock market collapsed in 2008-9 it was at a time when our “model” was telling us that stock prices was not overvalued either. So what could cause the stock market to plumment once again? Well, the easiest way to look at it is to look at the three factors in our “model”. First of all the level of nominal spending (here approximated by PCE), second the bond yield and finally a risk premium, which essentially is the residual between the actual level for stock prices and “fundamentals”. We know that nominal spending in the economy is determined by monetary conditions so one reason for a possible drop in stock prices could be that the Federal Reserve moves to tighten monetary conditions faster or more than expected by investors. That would cause a drop in nominal spending (and nominal earnings), which in our model would cause a drop in stock market “fundamentals”. A tightening of monetary conditions (relative to market expectations) could also cause an increase in bond yields through a liquidity effect. This would also push down “fundamentals” in our model. Hence, a faster than expected tightening of monetary conditions would cause stock prices to drop through these two channels. A third channel is an increase in the risk premium on stocks. This also could be caused by an excessive monetary tightening, but there are certainly also other factors that could cause such a spike in the risk premium – for example a Greek euro exit, Chinese financial distress, increased geopolitical tensions, a supply-driven spike in oil prices etc. This is all possible and all these factors could cause US stock prices to drop. However, there might equally be arguments for the opposite – that for example markets are wrong about the timing the first Fed rate hike. If the Fed for example where to come out and say that nominal spending growth is disappointing and rate hikes will be postponed until next year then that would cause an increase in the “fundamentals” in our model. So what I have been arguing in this post – like a year ago – is that US stock prices more or less reflect “fundamentals” (in a quite rudimentary form). However, I have also stressed that that on it own does not tells us anything about what will happen to stock prices in the future. My variation of the “Fed model” is not a “predictor” of future stock market gains. It is a simple reality check on the valuation of the US stock market. So use it carefully! PS I would normally get comments on these kind of posts from “internet Austrians” who would claim that bond yields are artificially low because they have been “manipulated” by the Federal Reserve. Well, lets just say that I believe that low bond yields in general mostly reflect expectations for long-term nominal spending growth and a risk premium (positive or negative), but if you think that the US government is about to go bankrupt and yields will spike dramatically then feel free to sell your stocks. Again I am not providing investment advice.